This is a list of the best medical and health WordPress themes designed for hospitals, medical centers, health clinics, doctors, dentists, surgeons, and other types of health and medical industry websites. Most of the themes have mobile friendly responsive designs and some include useful built-in features and functionality specifically for health and medical businesses including: timetables and schedules, appointment booking forms, pricing tables, custom post types to display medical services, and more. Medicus is a mobile responsive, multipurpose corporate WordPress theme from WPZOOM. The premium theme would be ideal for health and medical businesses such as hospitals, clinics, and healthcare practitioners but would also be suitable for any type of corporate or organization website. It has a widgetized homepage with a dynamic homepage builder so you can build and customize the layout and structure to suit your needs. You can also easily customize the colors and other designs elements (fonts, background, logo, menu, widgets and more) to suit your brand. Some of the other key features include: SEO friendly code, solid framework and automatic updates, directory template, various page layout options, blog section, easy translation and more. Pharma Plus is a multipurpose health and fitness WordPress theme. 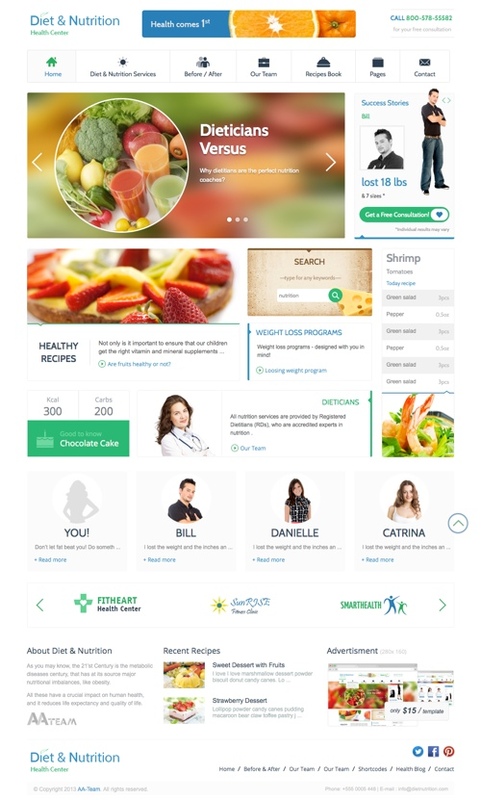 The premium theme could be used for health and medical websites, wellness centres, spas, gyms, and others. The theme includes functionality specifically for health and medical practices including appointment booking, time table, opening hours, staff, department management, pricing table, price plans and more. It has a mobile responsive design, an advanced drag and drop page builder, unlimited colour and background options, unlimited sidebars, WooCommerce ready, HTML5 and CSS3 code, translation options, Font Awesome icon sets and more. Medi is a professional, clean, almost clinical, business WordPress theme for health professionals and businesses. The premium theme from CSSIgniter is ideal for health clinics, medical centers, hospitals, doctors, dentists, and other medical and health related websites. The Medi theme includes a number of custom features including: custom post types and associated templates for services and personnel, custom widgets for open hours, scheduling, testimonials etc, and a custom contact form with map and location information. Other features include: a responsive design, theme options page for easy control and customisation, localisation options, shortcodes, HTML5 / CSS3 code, 7 colour scheme options and more. Medica Pro is a health WordPress theme for medical websites or health blogs. The premium theme from ThemeIsle is mobile friendly with a responsive design and has a custom homepage that allows you display information about your business, contact form, latest news and doctor profiles. Some of the other notable features of the theme include: unlimited color options, theme options, localization options, custom widgets and more. 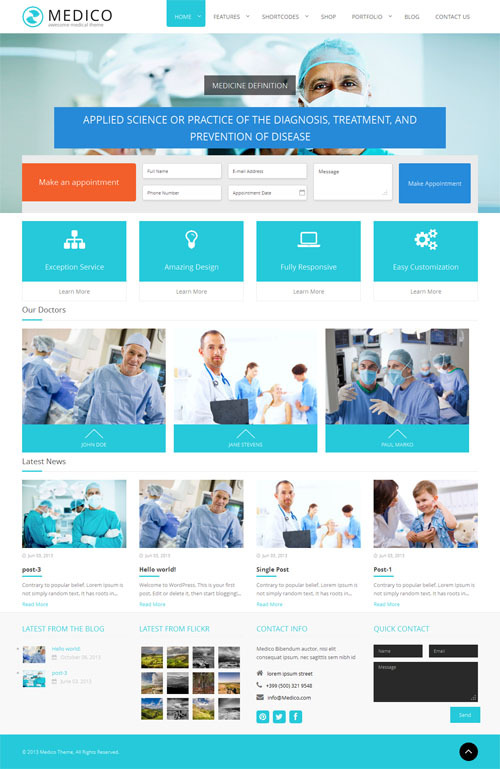 Denta is a medical styled WordPress theme that could be used for doctors, dentists and other medical practitioners. The premium theme from ThemeIsle has a clinical feel with a clean and professional design and suitable medical color scheme. It has a mobile friendly design, theme options, localization, unlimited color options, contact form, and sections on the homepage to present all the important information about your business. 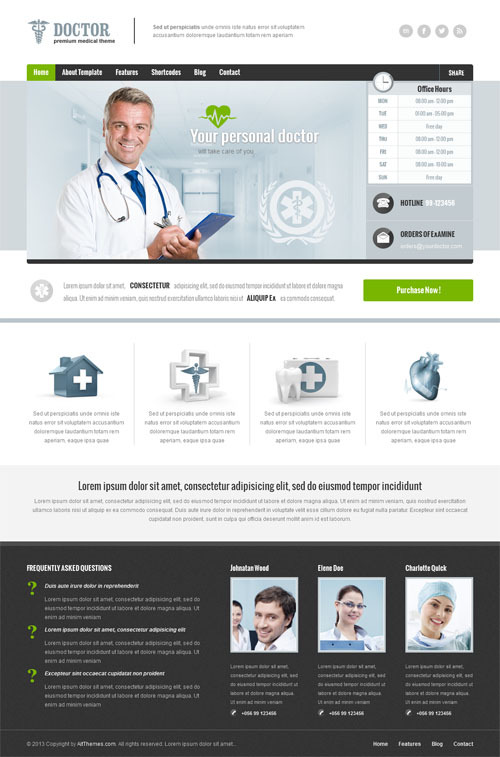 Medicom is a WordPress theme suitable for medical and health websites. The premium theme is built with Bootstrap and has a fully responsive design making it mobile friendly. It got a lot of great features including: 5 homepage variations, 3 header options, 8 difference colour schemes, visual composer page builder, Font Awesome and special medical icons, a mega menu, time table plugin, parallax and video backgrounds, directions map, advanced options panel and more. Medica is a premium health and medical WordPress theme from Theme Fuse designed specifically for doctor’s websites, health clinics, dentist websites, and other medical or health related business websites. Features of the premium theme include an online appointment booking module, numerous shortcodes, 2 featured sliders, custom typography, powerful theme admin options and more. 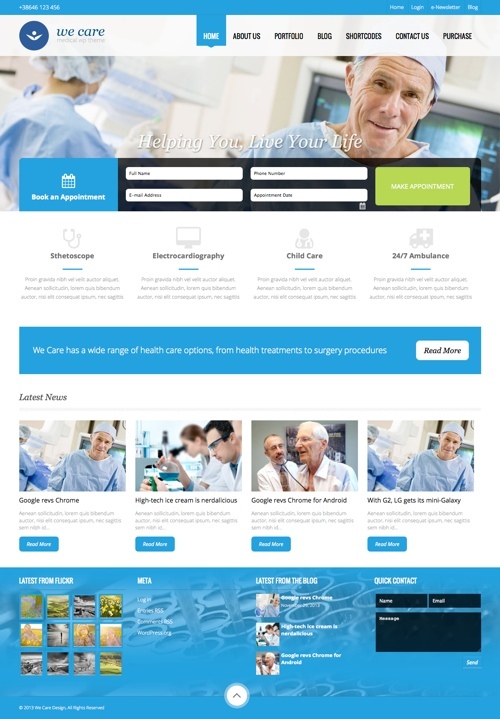 Health Center is a responsive WordPress theme built for medical practices, doctors, dentists, health clinics, medical centres, surgeons and others in the health and medical industry. Some of the key features of the theme include: a timetable schedule and appointment form, event calendar, drag and drop page builder, endless homepage and page layout possibilities, boxed or full width layout, unlimited styling possibilities, 9 custom widgets, WooCommerce support, 10+ portfolio layouts, sidebar manager, WPML compatibility, powerful options panel and much more. Curo is a medical and health WordPress theme from PressCoders designed specifically for health and medical professionals. The premium theme has heaps of features including: 9 colour schemes or built in colour pickers allow you to create your own, widgetzied content sliders which can be placed anywhere, 24 page templates and layout combinations, 8 custom widgets, custom logo uploader, robust theme options panel and more. 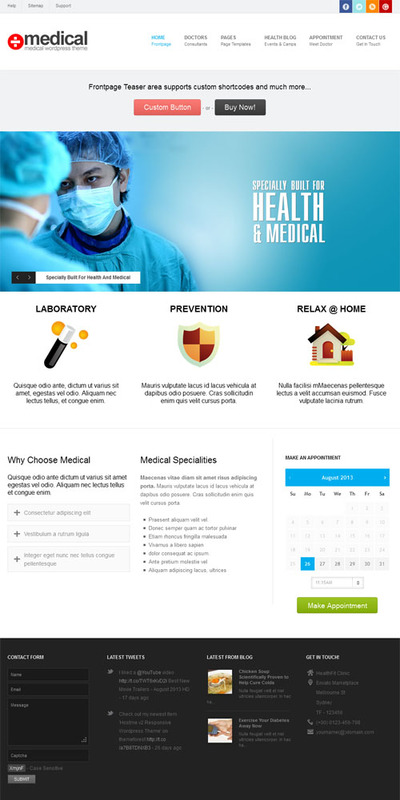 MediCure is a medical WordPress theme designed to be a perfect solution for medical websites. It includes functionality that was developed with health and medical websites in mind. Features such as a custom medical business oriented homepage design, testimonials, and custom services post type to display medical services of a large hospital down to a small private clinic. Some of the other features of the theme include: unlimited colour options, custom admin panel, a retina ready and mobile responsive design, drag and drop content composer, custom shortcodes and widgets, contact form builder and more. 123 Medicine is a WooCommerce powered ecommerce WordPress theme ideal for selling health and medical products. The premium theme has a clean and minimalist design and either a responsive or fixed layout. Some of the main features include: WooCommerce compatibility, a visual composer drag and drop page builder, theme options, featured slider, Bootstrap framework, multi-language WPML support, Google web fonts and more. 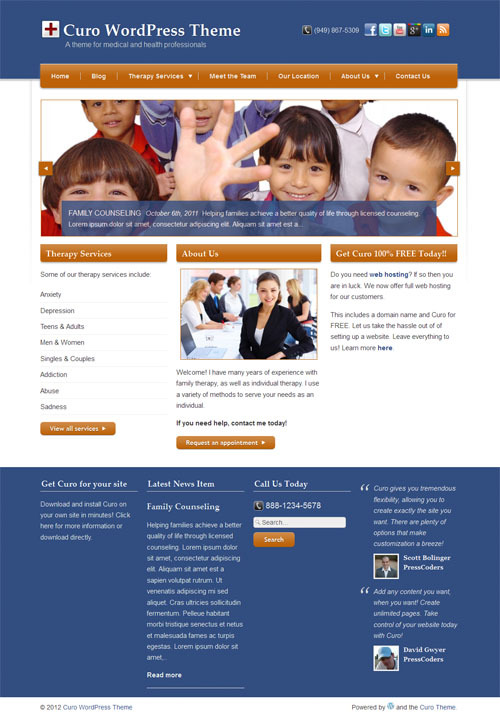 The We Care Medical WordPress theme is fully responsive and based on Twitters Bootstrap framework. Some of the key features include: unlimited sliders, colours portfolios and sidebars, 6 custom widgets 500+ Google fonts and icons, admin panel, pricing table builder, style manager and more. The Soul Medic WordPress theme has a flat, minimalist and modern design ideal for medical and health websites. The theme is suitable for doctors, dentists, surgeons, hospitals, health clinics and any type of health and medical related websites. It comes with wide or a unique boxed layout and is mobile friendly with a responsive design. The theme also features 25+ different page layouts such as doctors, departments, services, blog with comments, about page, events or schedule pages, event detail page, gallery with and without sidebar, 2,3,4 column content, contact, appointment etc. Other features include: a mega menu, WooCommerce support, multi-lingual WPML plugin support, 20 pre-defined skins, heaps of shortcodes and much more. MediCentre is a responsive WordPress theme suitable for health and medical related businesses and websites. The premium theme has a modern and minimalist style with strong colour accents and a flat design. It has wide or boxed layout options and has a fully responsive design that adapts and works on desktops right down to small mobile phone screens. It has a visual page builder so you can easily build any type of page, and also comes with 20+ predefined page layouts including different home page layouts, different blog layouts, about page, doctors list page, descriptive medical care page, medical departments page, timetable, different gallery layouts, contact page and more. Other features include: responsive pricing tables, built-in schedule manager, custom icons and fonts, options panel, customisable colour schemes, location maps and much more. 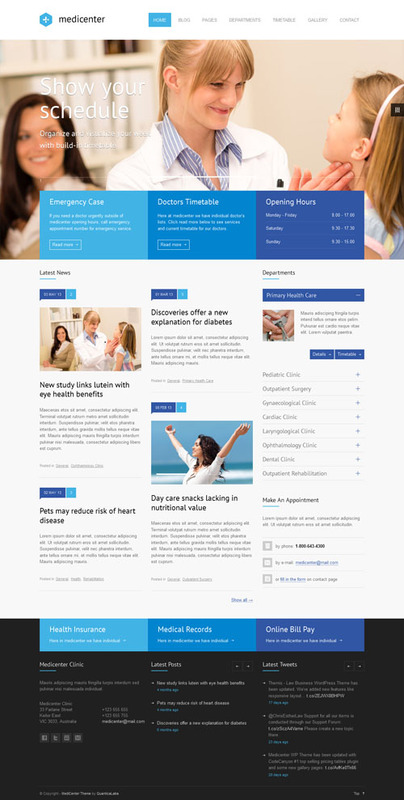 Care is a medical and health WordPress theme designed for doctors, dentists, health clinics and other medical related websites. The theme has unlimited colours and styles so you can easily customise the design to suit your business. Other features include: a mobile ready responsive layout, advanced options panel, Google fonts, customisable header, slider, contact form builder, pricing boxes, unlimited sidebars and more. Medical Plus is a premium WordPress theme designed especially for the medical, hospital and health care industry. The theme has a clean and professional corporate feel, Features include: a responsive design (mobile ready), drag and drop page builder, Google fonts, live colour changer (unlimited colours), drag and drop slider, price table, shortcodes, built-in translator, social links and more. The Health Press WordPress theme has been designed with health and medical oriented websites in mind. The attractive design is suitable for doctors, dentists, hospitals, health clinics, surgeons and other type of health and medical related websites. It’s built with HTML5 and has a mobile responsive layout and special features to manage services, doctors, gallery, testimonials, FAQs, and a blog/news section. Some of the other features include: easy colour change options, meta boxes, custom widgets (contact, appointment, location, newsletter etc), theme options panel, custom background support, multiple language support and more. 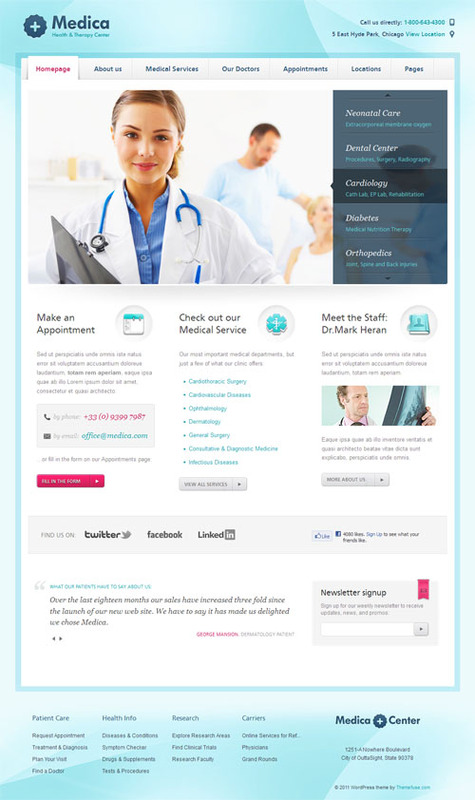 The Doctor WordPress theme is specially designed for any medical website, doctors, dentists, GP’s or even a hospital. The theme has a custom homepage design with featured slider and section for open hours, contact details and other information. It is mobile ready with a responsive design that adapts to fit on all mobile devices. Other features include: admin options panel, unlimited colour options, portfolio layouts, custom widgets, shortcodes and more. 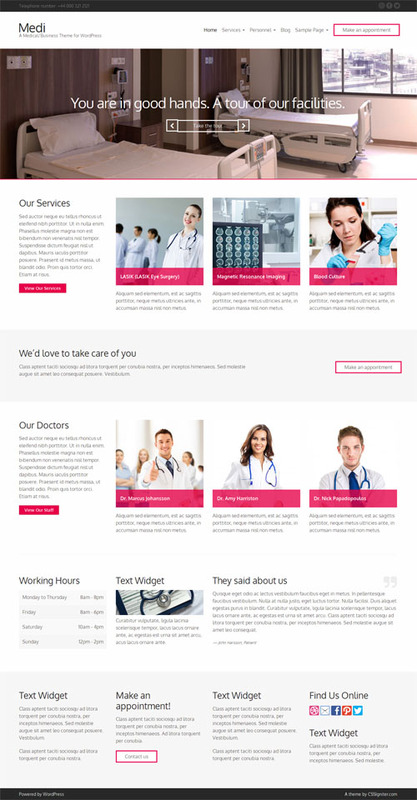 Medical is a feature rich WordPress theme aimed at the health and medical industry. Features include: advanced theme options, boxed or stretched layouts, appointment booking system, doctors / staff profiles page, shortcodes, custom widgets, custom fonts, unlimited colour options and more. Heal is a responsive medical WordPress theme with a unique design suitable for clinics, dentists, doctors and any other medical related websites. Features include 9 custom page templates, theme options panel, contact form, Google fonts, and more. Medicate is a medical and health WordPress theme from Themes Kingdom. The premium theme is designed for doctors, dentists, hospitals, health / medical clinics, surgeons and other medical and health related websites and blogs. It has a custom homepage design with a full width featured slider, content widget areas, and sections for staff, services and latest news. Other features include: a custom contact form, admin panel, responsive layout, custom widgets and shortcodes, email newsletter support and more. The Medical Doctor WordPress theme has a clean, flexible, retina ready and fully responsive design. 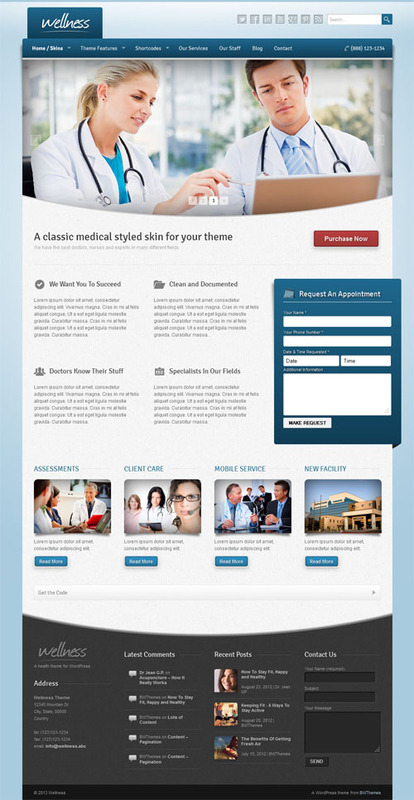 The premium theme could be used for any type of clinic, doctor, medical practise or health institute. It’s loaded with features and has powerful customisation possibilities thanks to a visual drag and drop page builder that allows you to easily create complete layouts. Some of the features include: fluid or boxed layouts, extensive admin options panel, custom post / page options, 4 header styles, Google fonts, live colour changer, unlimited sidebars, full localisation and much more. Diet and Nutrition Health Center is a WordPress theme with a clean, modern and mobile responsive design. Its suitable for websites about diet, nutrition, dietician, health, wellness, sport & fitness, weight loss and weight loss programs and for clinics / centers that offer these kind of services. Some of the main features of the theme include: pre-configured page layouts (homepage, diet and nutrition section, before and after, team, recipes, pricing and more), homepage slider, custom menu, banner ad spots, translation ready, social media options and more. Wellness is a responsive premium WordPress theme geared towards health and medical websites. It could be used by medical clinics, health practices, medical centres and other medical businesses. Features include: a mobile friendly responsive layout, appointment request form, 4 colour skins, options panel, slider, shortcodes, and custom widgets. Happy Health is a health and medical WordPress theme designed for health industry websites such as health clinics, hospitals, dentists, and vet clinics, and could also be used for service orientated businesses such as spas, beauty salons, and others. The commercial WordPress theme from Cubic Themes has a custom homepage design that allows you to display your open hours, various featured slider sections, and other information about your business and services. Some of the other key features of the theme include: a mobile responsive design, 3 colour variations, custom post types for services and staff, optional parallax scrolling, left or right sidebars, custom shortcodes, HTML5 and CSS3 code, custom widgets, theme options and more. 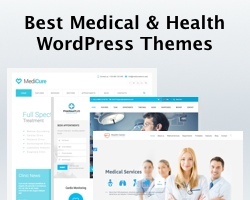 Medico is a premium WordPress theme designed specifically for health and medical websites. Its mobile ready with a responsive design. Some of the features include: a custom homepage design, box or wide layouts, appointment booking form, price table builder, unlimited sidebars, advanced admin panel with customisation options, portfolios (2,3 or 4 columns), visual shortcode generator, Google fonts, unlimited colours and more. While the themes above have been designed (marketed) for health and medical websites, there are heaps of other great business style WordPress themes that would work just as well. Check out the galleries below for other quality themes.